The FIRST Robotics Competition is a high school robotics competition organized by FIRST, an organization founded by Dean Kamen. FIRST, which stands for For Inspiration and Recognition of Science and Technology, sponsors and organizes not only FRC, but also FIRST Tech Challange, FIRST Lego League and Jr. FIRST Lego League. Of these four competitions, FRC is the top level, as FIRST itself puts it, "The varsity sport for the mind." FRC teams are given a kit of parts and 6 weeks to construct a robot to compete in a game. The game changes every year, making each challange unique. Students are in charge of construction, wiring and programming, as well as fundraising and community outreach. The 2017 FIRST Robotics Competition game was Steamworks. Steamworks is an objective based game where each alliance prepares it's airship for liftoff. Alliances gain points from either shooting fuel into a boiler or collecting and delivering gears to an airship. At the end of the match you can climb aboard the airship for additional points! Below is the 2017 FRC Game Animation. ​The 2016 FIRST Robotics Competition game was Stronghold. Stronghold is a return to traditional robot-on-robot contact, with a focus on rough terrain handling and ball manipulation. The balls in use are very similar to those used in the 2012 FRC game, Rebound Rumble. There is also a strong focus in Stronghold on vision and communication. Below is the 2016 FRC Game Animation. The 2015 FIRST Robotics Competition game was Recycle Rush. Recycle Rush is played in alliences of three who seek to stack trashcans and storage containers. It is a unique game in that it is one of the only FIRST games to not require bumpers on the robots, as there is no robot-on-robot contact within the game, and alliances are separated. Below is the 2015 FRC Game Animation. The 2014 FIRST Robotics Competition game was Aerial Assist. Aerial Assist was unveiled on January 4th during the FIRST Robotics Competition Kickoff. Similar to the FRC games of 2008 and 1998, Aerial Assist is played with large medicine balls. Aerial Assist, however, is focused much more on cooperation between robots than previous games. Alliances can score much larger amounts of points though cooperation than individually. Details on Aerial Assist can be found in the 1 page game summary. Additional game information can be found my clicking on the game logo to the left. Below is the game animation, which runs through basic gameplay. The 2013 FIRST Robotics Competition game was Ultimate Ascent. Ultimate Ascent was a frisbee based game with a climbing endgame strategy. Alliances of three robots worked to score and block the other team. ​Below is the FRC 2013 Game Animation. 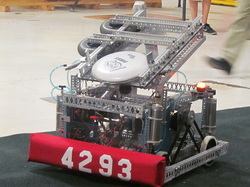 The 2012 FIRST Robotics Competition game was Rebound Rumble. This was the first game that Team Komodo participated in. Rebound Rumble was a basketball focused game which encouraged teams to gather and hold multiple balls and then shoot buckets. Despite the fact that all the robots were traveling (and probably double dribbling), Team Komodo had a ton of fun with this cooperative game. The endgame of Rebound Rumble was a balancing act on ramps in the middle of the field. Below is the FRC 2012 Game Animation.